“Meet Tarzan, a 6-7 week old colt orphaned during an ’emergency’ roundup of the Seaman NV herd. He was fortunate to be adopted by photographer Jeanne Nations who used an old tarp to make him this simple shaded shelter in the corner of his paddock. It’s Tarzan’s shade, shelter & sanctuary. Do the foals at Palomino Valley need and deserve any less?” ~ Carl Mrozek, filmmaker and Advisory Board Member of Protect Mustangs. “Tarzan wanders in and out of the shelter all day. He will go eat some hay, drink water then go back to the shade, especially during the hot afternoons where he’ll take siestas. If he ‘s frightened by dogs, thunder, loud noises…anything, he’ll run there. It’s his safe haven and he spends the night there too. 3.) Fabulous questions repeated but NOT answered by the BLM nor their contractors. 4.) BLM personnel NOT providing answers to questions and evading transparency. One of the Ph.D.s explained the “basic necessities’ for humane horse care yet she avoided listing “shelter”. That same Ph.D. is known for citing failure to provide shelter as “Neglect”. The Ph.D. avoided the question and made the statement that her study was for California domestic horses not wild horses. Captive wild horses deserve shade. 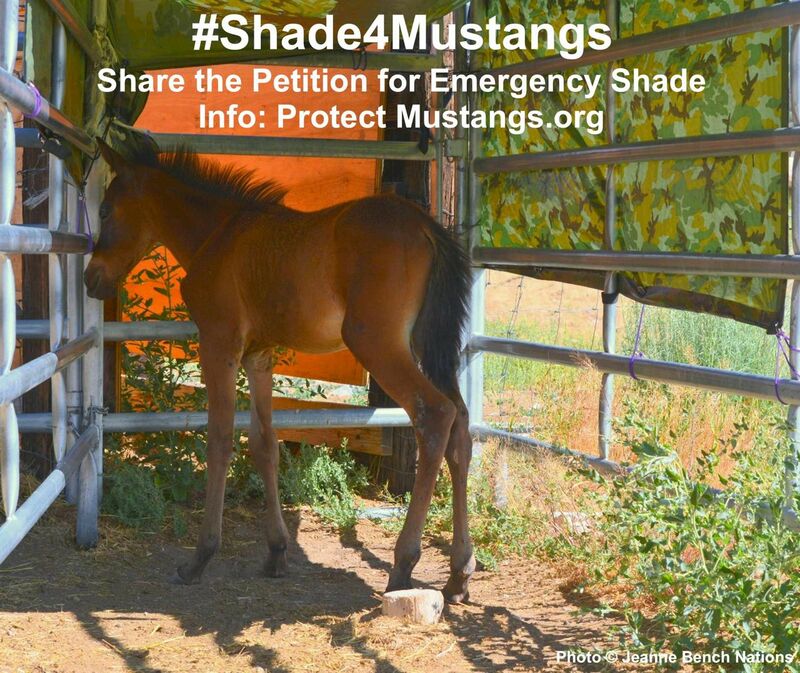 Adopters are required to provide not just shade but also shelter in order to adopt a wild horse that the BLM wants to dispose of. Should the BLM be allowed different care standards than they demand of their adopters? Why is a Ph.D.s skewing their published studies and standards of care to avoid requiring shelter for wild horses? Later the workshop facilitator was pushing for the attendees to accept the BLM’s idea to give shelter to only the sick and injured wild horses but advocates would not be duped into supporting such an offer. 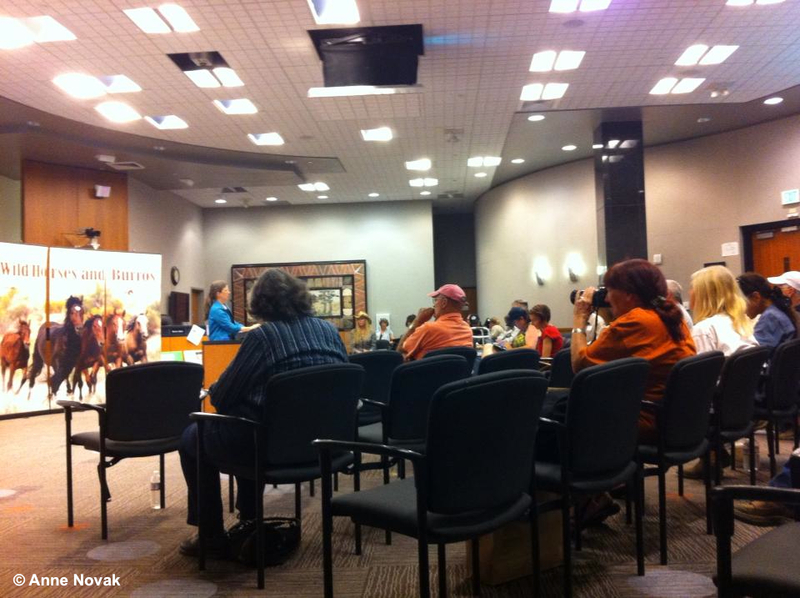 Advocates stayed on focus and requested shelter for all captive wild horses and burros. We are grateful the advocates in the room and many viewing the web transmission saw through the Delphi Technique used at the meeting and left more empowered and unified to get shade and shelter for the wild horses at Palomino Valley Center and elsewhere. We want to thank our supporters who donated toward the gas to get the Protect Mustangs delegation to the meeting. Please email your friends and relatives to meet the challenge for 50,000 signatures. Here is the petition: http://www.change.org/petitions/bring-emergency-shade-for-captive-wild-horses-and-burros Thank you! Video Investigation reveals wild horses are dying in the heat wave! As a result of public outcry, the Bureau of Land Management is holding a public workshop at the Reno City Council Chamber in Reno, Nev., on Aug. 6 from 5:30 to 9:00 p.m.
4 horses died during the last heat wave but only 3 deaths (A,C,D) could be related to the heat wave. (see email from BLM below). Strangles is a respiratory illness (Equine Distemper). Horses with repiratory illness have a higher chance of death when enduring a heat wave, because they are already having difficulty breathing and the heat aggrivates that. * PVC’s Vet and staff reported no signs of heat-related symptoms prior to the deaths of #10617585 & #12619358. In addition, these animals had a continuous supply of water, quality hay, and sprinklers present; therefore, there was no life or death issue present. It is not always possible to make a determination of the cause of death. But, if the BLM has any future deaths at PVC that are not associated with a particular illness or injury, a necropsy will be performed. 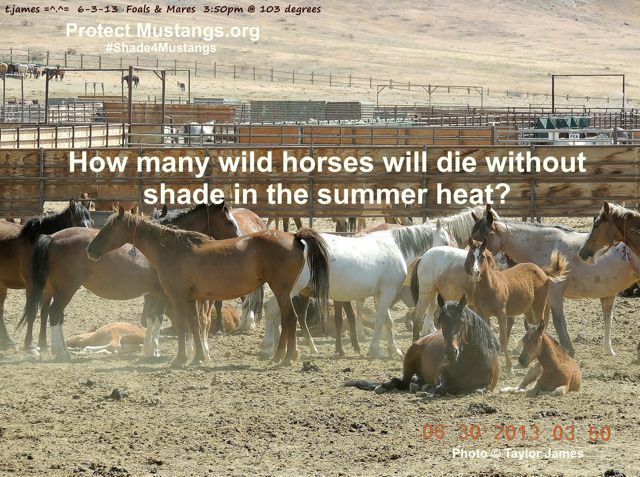 RENO,Nv (July 8 2013)–Protect Mustangs is releasing a preliminary video report of captive wild horses denied shade in the recent triple-digit heat wave. Anne Novak, executive director of Protect Mustangs, America’s indigenous horse conservation group, has been leading a nationwide outreach campaign (#Shade4Mustangs) on Facebook and Twitter to bring shade to captive wild horses and burros at Palomino Valley Center outside Reno, and elsewhere. Last week’s heat wave broke records. The Bureau of Land Management (BLM) refused to install shade despite Novak and Senator Mark Manendo’s requests, outcry from the public and other groups. 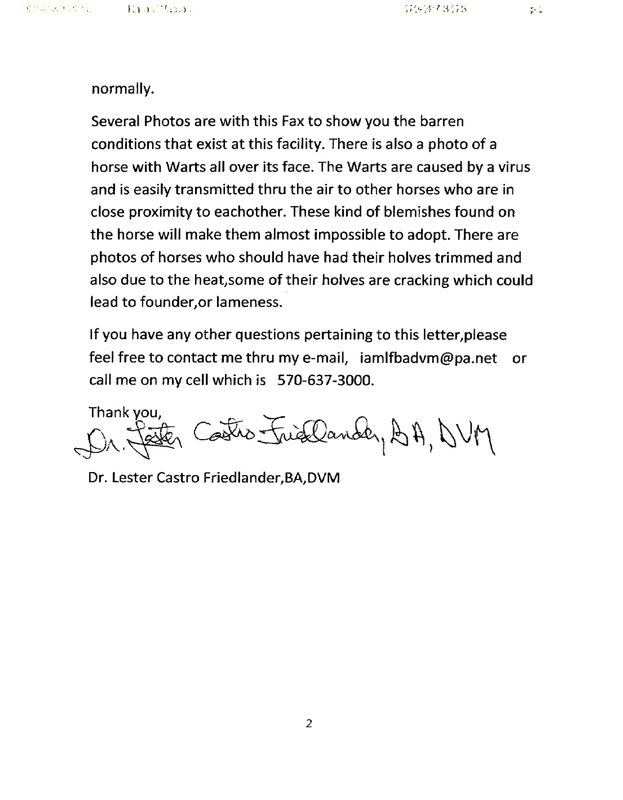 Protect Mustangs conducted a field investigation during the heat wave with the help of Reno photographer Taylor James, Jim Hart the President of Liberty for Horses and Dennis Walker. The video report calls for the new Interior Secretary, Sally Jewell, to have compassion and bring emergency shade because captive mustangs are sick and dying. In the wild they can migrate to shade and cooler zones. Trapped in pens it’s cruel to deny them access to shade and shelter. The heat wave investigation found horses without shade who appear to have respiratory illness, as well as ones who have other illneses and diseases. They are exhausted from repeated exposure to triple-digit temperatures, sore, stiff, probably lame foals, lactating mares, and young wild horses who also appear dehydrated, obese horses, hot sweaty horses and hot horses not sweating, young horses not wanting to get up and eat, who are ill or dying as well as a dead filly the group named “Shadow”. When the summer heat started to rise on June 9th Anne Novak & Senator Manendo officially called for shade for more than 1,800 captive wild horses at Palomino Valley Center, the largest short-term federal holding facility in America. Novak uses Facebook & Twitter to reach thousands of people through her widespread outreach. Celebrities such as Daryl Hannah, and Holly Marie Combs graciously shared out Novak’s calls for shade. 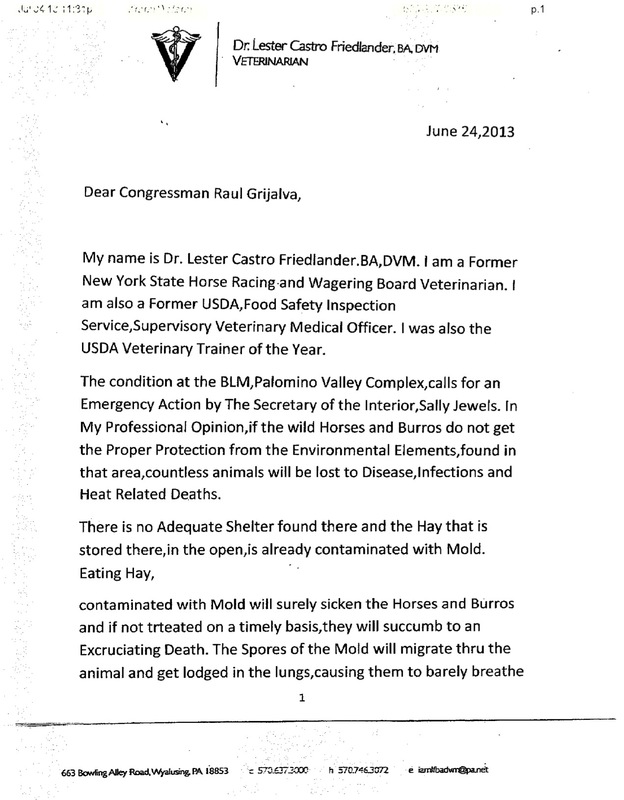 On June 24, 2013, esteemed Dr. Lester Friedlander BA DVM called for an emergency action to bring shelter to the wild horses and burros. Novak continued to contact elected officials, Bureau of Land Management (BLM) personnel and the newly appointed Secretary of Interior, Sally Jewell, requesting shade to prevent deaths from the upcoming heat wave. To this date she has not heard back from Secretary Jewell. No shade was provided in triple-digit heat–only a handful of ineffective sprinklers for “mitigation”. 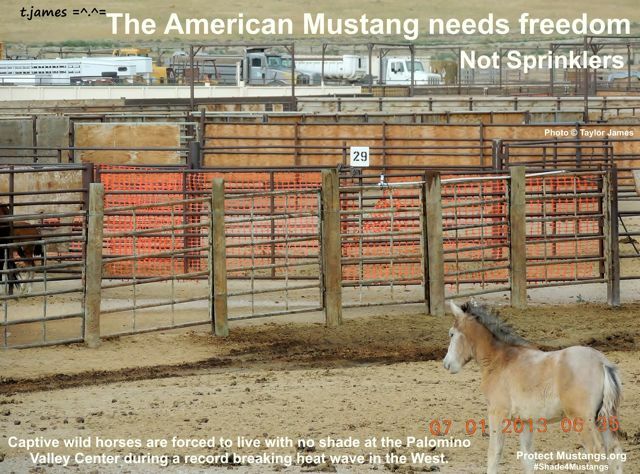 Neither Protect Mustangs nor Dr. Friedlander suggested using sprinklers. They requested shade and shelter. Dr. Friedlander DVM and Anne Novak warned the Bureau of Land Management that the wild horses would suffer disease, infections and heat related deaths without shelter from the heat. Protect Mustangs has been working with Dr. Lester Friedlander BA, DVM, photographer Taylor James, Jim Hart, President of Liberty for Horses, Dennis Walker and other advocates to document the fiasco during the record-breaking heat wave and advocate for change–shelters for wild horses and burros in holding facilities. Despite the BLM’s ‘sprinkler mitigation’ PR campaign, the Protect Mustangs’ investigation found sick, sore, horses as well as a dead filly hours before the BLM facility official, Jeb Beck, gave Fox News an interview about the ‘sprinklers’. 5.) Wild horses stayed away from the sprinkler. 12.) Yearlings and other horses who were lying down, breathing hard and not getting up to eat. Novak has requested the mortality count during the heat wave since June 27 and wants to know the number of sick horses also. Witnesses Hart & Walker asked to view the sick pens but were denied permission to view from a distance. 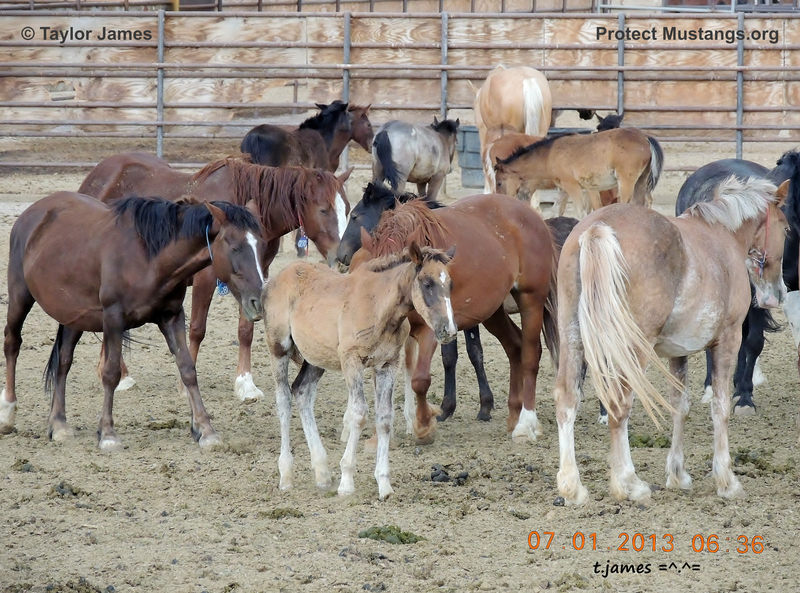 Palomino Valley Center doesn’t keep track of the dead unbranded foals according to Heather Emmons Jasinki, Public Affairs Officer for the Bureau of Land Management. Less than 18,000 native wild horses and burros are estimated to be living in freedom in all ten western states combined. Today more than 50,000 are stockpiled in government funded holding–at risk of disappearing into the slaughter pipeline. Horse advocates want to see them returned to the range. The National Academy of Sciences has stated there is no accurate population count. Protect Mustangs, AANHCP and other horse advocate groups know that when a scientific population study is done, the numbers will be very low. The BLM’s population numbers have been inflated by BLM to justify costly roundups and removals for the public land grab and industrialization. “The phrase Potemkin villages (an alternative spelling is Potyomkin villages, derived from the Russian: Потёмкинские деревни, Potyomkinskiye derevni) was originally used to describe a fake village, built only to impress. The phrase is now used, typically in politics and economics, to describe any construction (literal or figurative) built solely to deceive others into thinking that some situation is better than it really is. It is unclear whether the origin of the phrase is factual, an exaggeration, or a myth.” ~ Wikipediahttp://en.wikipedia.org/wiki/Potemkin_villageWe need ‎#Shade4Mustangs Please SHAREA special shout out to Taylor James who has gone out to document the native wild horses during the heatwave. She is very dedicated to America’s icons of the West.Photo © Taylor James , all rights reserved. Photo taken by Taylor James on July 1, 2013 at Palomino Valley where the BLM employees refuse to give the 1,800 wild horses shade in the triple-digit heat wave.